Birmingham Jethavana community trust in UK pays tribute to war heroes. The Jethavana Trust community in Birmingham UK got together on 24th May to show and support their sodality with their countrymen and women. Head of Temple Ven: Keppetiyagoda Gunawanasa Thero lead the project and gave and introduction to the event. The theme was base on one hour meditative prayers according to Buddhist rituals. The purpose was to bless all those fallen soldiers from the trio forces and the said casualties of war our own Sri Lankan Civilians. The Gunawansa a thero also mention that due to the war country men and women live through the fear, due to the Presidents intelligent intervention with his heroic brother Gothabaya Rajapaksa and his brave trio forces team, their dedication and also love for the mother land allowed us to be free. The committee organised candle light and oil lamp vigil with baskets of flowers. There were over 200 devotees attendant the prayer service. Resident monk Ambagahawewa Medankara observed five precepts and conducts the one hour Bodhi Pooja with chanting and meditative prayers. Dr Kebalawe Sri Sumana maha thero head of Upton Park Temple also joint and offer his blessings. He also mentioned that the duty lays behind us People of Sri Lanka to look after the Civilians and their families also give our best support to those who needs it right now. This event specially organised by mr. Santha perera. And also, they have arranged to send some humanitarian needs (dry foods and other needs) and necessary very important items (beds, wheelchairs, frames, walking sticks, etc.etc) for Sri Lankan army hospital. These items organised by Dr, Panagamuwa, Mr,Boraluwa and Mr,Shantha perera. 'Sebalaneni' - the latest single by popular young artist Ranidu Lankage and produced by Sri Lanka Telecom Mobitel, the National Mobile Service provider was presented to Secretary of Defence Mr. Gotabaya Rajapaksa at the Ministry of Defence premises today (20th May). This song was created as a special tribute to his Excellency the president, Secretary of Defence & our Heroic Security Forces, for their untiring commitment and dedication in uniting our nation. The 'Sebalaneni' song is also available exclusively on Mobitel m tunes (caller ring back tone) and Mobitel customers can now select this song as their mTune by typing "21212" and SMSing to 777. This service would be available at a fee of Thirty rupees per month and proceeds from this service also contribute to the 'Api Wenuwen Api' fund. The music video of 'Sebalaneni' would be available in DVD format at all Mobitel outlets in the near future and all proceeds from the sale of each DVD is to be contributed to the 'Api Wenuwen Api' fund. Mobitel customers would also be able to further contribute to the 'Api Wenuwen Api' fund by downloading 'Sebalaneni' Ring - tones from wap.mobitel.lk and also by downloading 'Sebalaneni' Wallpapers from wap.mobitel.lk in the near future. 'Sebalaneni' was composed and sung by Ranidu Lankage, while the lyrics were written by Anuradha Uduwage and the music video was directed by Subash Pinnapola. As a token of gratitude towards the security forces personnel fighting against the ruthless terrorist organization to bring peace for entire country, the Sri Lanka Rupavahini Corporation (SLRC) donated 3 Million rupees for the "Api Wenuwen Api" housing project yesterday, 6 May. The fund was raised, launching a project to sell flower bouquets for the public at the "Dayaka Kirula" exhibition held at the BMICH on February. The cheque worth of 3 Million rupees was official handed over to Secretary Defence Mr Gotabaya Rajapaksa by Chairman of SLRC, Professor Ariyarathna Athugala, during a charm function held at the Defence Ministry premises. Speaking at the event, Professor Athugala expressed his heartiest gratitude on all staff members who collectively contributed to make this donation a success. Mobitel's staff contribution to the "Api Wenuwen Api" Housing Project undertaken by the Ministry of Defence to date amounts to Rs. 1 million and this was a sequel to the company's contribution of Rs. 10 million made last year, further, Mobitel staff pledges to extend their support by contributing over Rs. 1.4 million to the fund by the end of this year. Speaking at the event, Mrs. Leisha De Silva Chandrasena, Chairperson Sri Lanka Telecom Mobitel said 'The fund is a mark of gratitude to our gallant forces fighting to save our motherland and we are grateful and proud of the generous and voluntary contribution made by our staff towards this worthy cause. Mobitel, the National Mobile Service Provider recently handed over a cheque worth of Rs 3.2 million contributed by its subscribers, to the "Api Wenuwen Api" Housing Project undertaken by the Ministry of Defence, taking the subscribers total contributing to the fund up to Rs. 5.6 million to date. This contribution was a result of an "ApI Wenuwen Api" promotion via SMS and popular Value Added Service mTune (Caller Ring Back Tone) where all proceeds from the selection of songs on mTunes under the category "Api Wenuwen Api" was contributed towards the fund. Dialog Telekom Ltd donated a sum of Rs. 3 million to the Api Wenuwen Api fund based on the special Ranaviru card purchases. This donation was made for the welfare of war heroes at the Ministry of Defence premises on 28th April. With this donation the total contribution made by the Dialog Telekom has gone up to Rs. 5 million. Mr Supun Weerasinghe, Chief Executive officer-Dialog Mobile and Mr. D.A.Y.De Silva, a distributor handed over two cheques to Secretary Defence, Mr Gotabaya Rajapaksa at the Defence Ministry premises. The Ipalogama Housing scheme in Anuradhapura built for the brave soldiers who fought valiantly for their mother land was visited by the Secretary of the Ministry of Defence Public security Law and Order Mr. Gotabaya Rajapaksa yesterday (26). The housing scheme is now under its final stage of construction. The Sri Lanka Navy is currently in charge if building. This housing scheme is under the Api Venuwen Api fund for the brave soldiers who are tirelessly defeating the terrorism which has been a cancer in the country for the past three decades. Mr. Gotabaya Rajapaksa urged those in charge of the construction to rapidly finish the project. Meanwhile the pre-school which was constructed earlier was also toured by the Secretary of the Ministry of Defence. The Secretary of the Ministry of Defence also met and expressed his gratitude to the Sri Lanka Naval Engineers who worked so tirelessly for the betterment of their comrades. Mrs Ioma Rajapaksa, the Additional Secretary to the Ministry of Defence, Public Security, Law and Order Mr. Willy Gamage along with many senior officers of the tri-forces also participated in the visit. The 'Api Wenuwen Api' committee in the state of Texas, USA donated USD 50,120 to the 'Api Wenuwen Api' Housing Project undertaken by the Ministry of Defence. The cash donation was handed over to Secretary Defence Mr. Gotabaya Rajpaksa through the Sri Lankan Embassy in Washington DC recently. The committee spokesperson said that the Sri Lankans living in Austin, Dallas, Houstan, New Orleans, Lubbock and San Antonio have raised these funds as a mark of gratitude to the security forces personnel fighting to rid the motherland from LTTE terrorists. "Contributors are so grateful to the Ministry of Defence for giving them an opportunity to be a part of the great cause", the spokesperson further said. The Api Wenuwen Api committee in the UK has donated £ 9820 to the Api Wenuwen Api housing project undertaken by the Ministry of Defence, Sri Lanka. 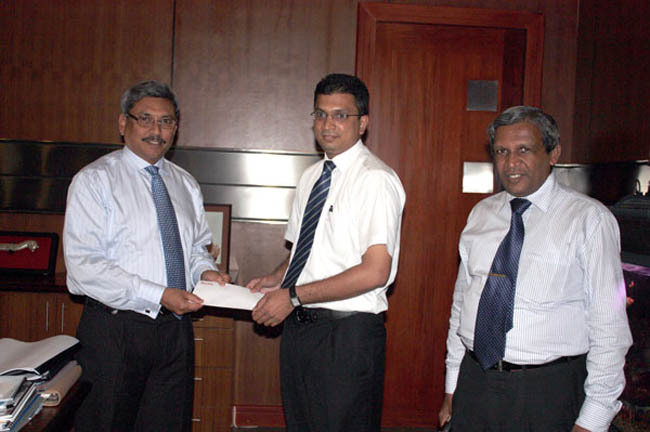 Brigadier Prasad Samarasinghe handed over the donation to Defence Secretary Gotabaya Rajapaksa yesterday (Apr 15) at the Ministry premises. Brigadier Samarasinghe said that the Sri Lankans in the UK as a mark of their gratitude to the armed forces fighting to rid their motherland of terrorism raised the donation. With the latest donation the total contribution of the Api Wenuwen Api committee in the UK has increased to £ 103,902. Defence Secretary Gotabaya Rajapaksa receiving the donation expressed his gratitude to the all who have contributed their hard earned money to the fund and also praised the commitment of the Api Wenuwen api Committee in the UK. 4.3 Million Sri Lankan rupees, collected from the patriotic Sri Lankans living in Dubai and Abu Dhabi to upgrade the medical and welfare of the disabled war heroes, was officially handed over to the H.E President Mahinda Rajapaksha at the Temple Trees this morning, 7 April. The "Api Wenuwen Api" musical show had been held on 21st and 26th November 2008 in Dubai and Abu Dhabi respectively to raise funds for the welfare of the war heroes at the "Ranaviru Sevana" in Ragama. 3 million rupees was collected from the musical event held in Abu Dhabi organized by the Sri Lankan Embassy in Abu Dhabi, UAE, while 1.3 million rupees were collected from the even held in Dubai organized by the 'Hela Bima' foundation.